Kohimarama: The Bay of Water Sport. One of the core benefits of staying with us at Aarangi motel is how close in proximity we are to the beautiful Kohimarama Beach, now don’t get me wrong, it’s a beautiful beach with calm waters and native trees sprawling alongside the water, but it’s also home to something a little more exciting: water sports. If you are keen to try something new, explore the bay, or just want to get out in the water in a new and exciting way, there are a handful of activities ripe for the picking! Stand Up and Paddle with Chris is the bays go-to man if you want to learn to paddle board or just hire one for the day, Paddleboarding has had a huge comeback from the late nineties to become a go to activity on the water, it’s relatively easy to pick up and the calm waters of Kohimarama make for perfect paddle boarding conditions. 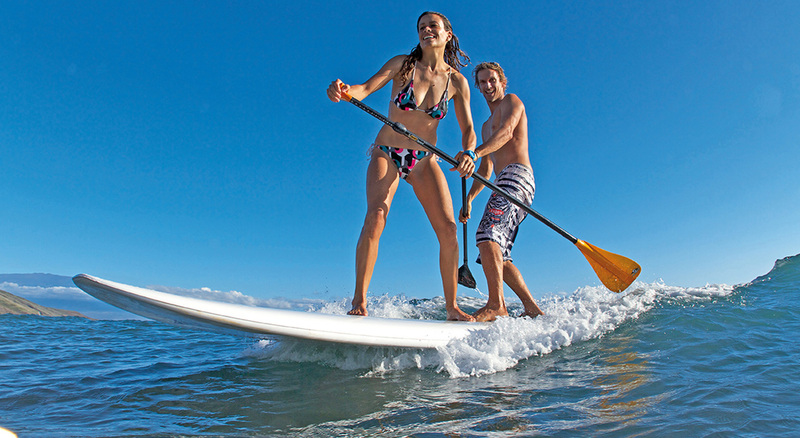 Paddleboarding is a great way to explore the bay and enjoy a tranquil and peaceful experience out on the water. Now if you want to dip your toes in a variety of activities look no further than Fergs Kayaks. As the name suggests their primary business on the water is Kayak tours, and they are famous for this for a good reason, the half-day tours around Rangitoto around sunset are unforgettable and go where no other means can take you, but if half a day seems like too much, there are three hour scenic tours around North head as well. Beyond kayaking adventures, Fergs also offers paddleboard hire and lessons, rollerblade/bike rentals and Kayak rentals. Now if you’re thinking that Kayaking and paddle boarding are a little too slow for you, don’t worry, for a little bit of speed on the water look no further than Auckland Jet Ski Hire! This company offers a bevy of activity, from guided tours from stunning Maraetai, the Hauraki Gulf islands, and Waiheke Island or go at it on your own by hiring a Jet Ski to get out and explore with! Maritime NZ approved for safety, the jet skis can be hired with a sea biscuit, wakeboard, knee board or water skis! So no matter your skill, interest, or type of thrill, there is an activity for you to dive into to explore and make the most of the wonderful Kohimarama!